So, I had planned as far as getting here to Bourg d'Oisans and a bike to ride while I'm here, but not much beyond that. So when I awoke this morning, I had no idea where to go. Over breakfast I perused a folder of local rides and continually exclaimed "ooh, that one looks good, nah this one is too easy... but THIS one is good". 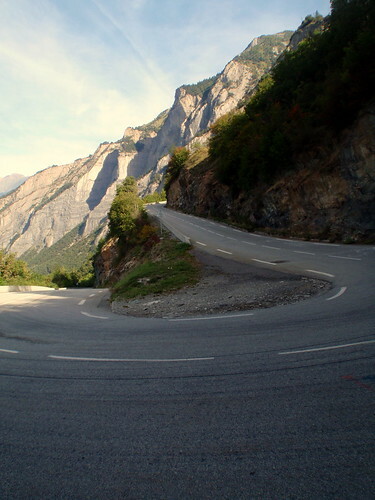 Eventually I reached sensory overload and chose to just go do L'Alpe d'Huez. I knew this bad boy was close to town, but I wasn't prepared for how close. I'd barely clipped in when *WHAM* (that's the noise of the mountain hitting me in the face) I was hit in the face by the mountain. Kind of like Hotham from the Bright side but this doesn't even have the decency to send you along a false flat first. In hindsight, it stacks up (numerically) a lot like Donna Buang 15km and 1km per ascent. 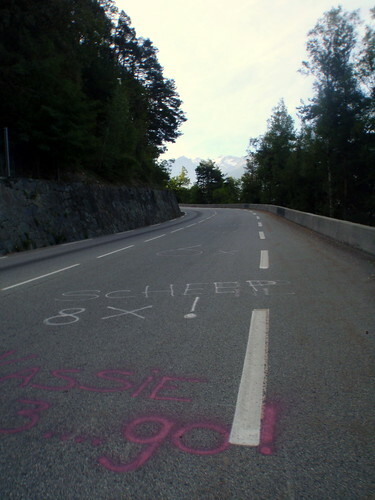 I suppose it rode a lot like Donna as well, a steady gradient from start to end, but something about the fact that it's a integral part of almost every TdF and Armstrong, Schleck (Andy) and Sastre are the names of the last 3 blokes to conquer the stage up it made it different. Even if you forget, each corner has a little sign with the name of one of the winners. Nah, not intimidating at all. Oh yeah, and then switchbacks, god there were heaps of them. I wasn't sure which section Lance looked back at Jan in the 2001 Tour and I definitely climb more like Jan than Lance.... but in a fit of bike nerd, I re-enacted it. Please don't judge me. I hoped to descend over the back and hit it from the other side... I could have sworn I read somewhere that there was a road up the back, but I couldn't find it, so had to content myself with flying down the face, grinning at everyone that was sweating and grinding their way up.